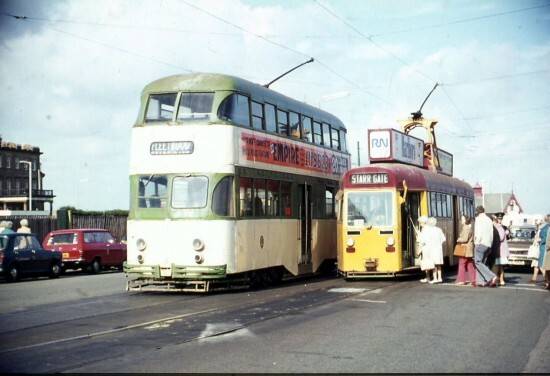 The number of photos taken on Fleetwood Esplanade of trams either at the old Fleetwood Ferry loading stops or just passing by on their way back to Blackpool is probably in the millions by now and today that is the location we are at for the latest delve into the archives. In this view we have two trams in situ – a Balloon Car and an OMO. Unfortunately neither tram is easily identifiable as the numbers can’t be seen on the trams but the OMO car – which is in the original Plum and Custard livery carried by this class and also has roof advert boxes – is loading passengers through the front entrance as it prepares to embark on a full length journey to Starr Gate. Alongside the Balloon Car doesn’t seem ready to return to Blackpool just yet as its destination blind is still set to Fleetwood. The Balloon carries between decks adverts for Empire Pools and has the Corporation crests on the lower panels. I would guess, looking at the lack of roof windows on the balloon, that at the time plum & custard OMOs were still operating, it could be either 707 or 712.